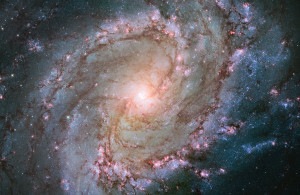 The Southern Pinwheel Galaxy, also known as Messier 83 (M83), is a barred spiral galaxy located in Hydra constellation. M83 lies at a distance of 15 million light years from Earth. It is one of the nearest and brightest spiral galaxies, and can even be seen in binoculars. The galaxy appears face-on when viewed from Earth. Messier 83 was nicknamed the Southern Pinwheel Galaxy because of its prominent, very well defined spiral arms, which give the galaxy an appearance similar to the famous Pinwheel Galaxy (Messier 101), located in Ursa Major. 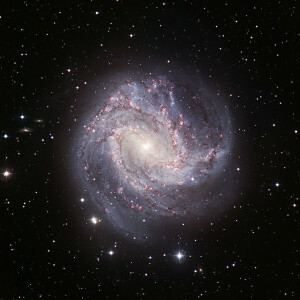 Messier 83 has the designation NGC 5236 in the New General Catalogue. 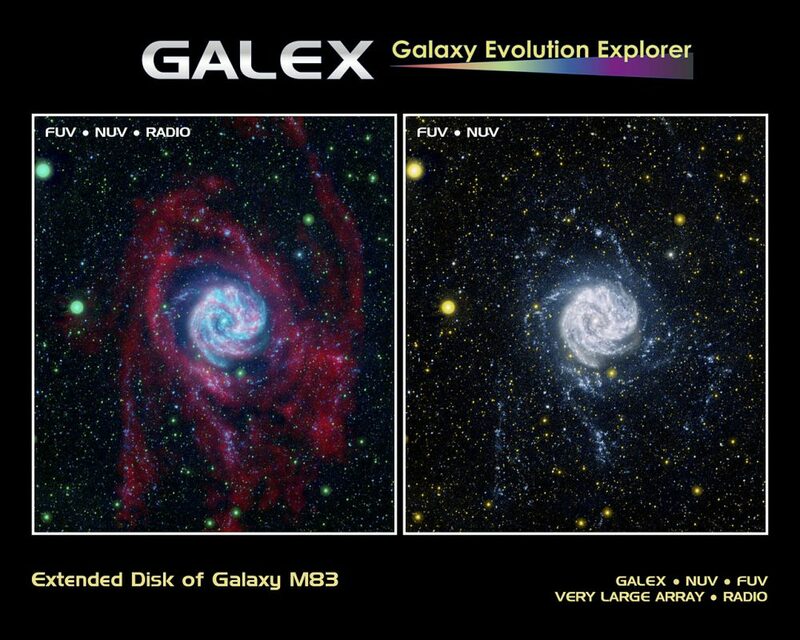 In spite of its majestic appearance, M83 is less than half the size of our own galaxy. Like the Milky Way, the Southern Pinwheel Galaxy is a barred spiral, containing a bar-like pattern of stars across its central region. If we could see our own galaxy, it would probably look similar to the Southern Pinwheel. 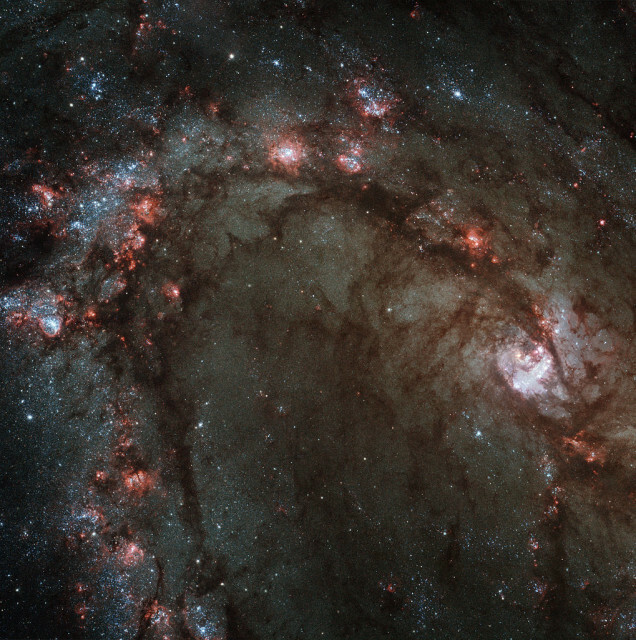 Messier 83 stretches across an area of over 40,000 light years, which is roughly 40 percent the size of the Milky Way Galaxy. A number of barred spiral galaxies have highly luminous central regions. This happens because the central bar channels gas toward the galaxy’s core and the gas is then used to form new stars. Like many other barred spirals, the Southern Pinwheel is classified as a starburst galaxy. The galaxy is undergoing more rapid star formation than the Milky Way, especially in its central region. The Southern Pinwheel Galaxy lies at the centre of the M83 Group, a subgroup of the Centaurus A/M83 Group, which includes the peculiar radio galaxy Centaurus A and the galaxy NGC 5253, also located in Centaurus constellation. The galaxies in the two groups are physically close to each other and the groups seem to not be moving relative to each other, so they are often identified as a single galaxy group. The central region of Messier 83 is quite unusual. Like our neighbour, the Andromeda Galaxy (Messier 31), M83 has a double nucleus. The double nucleus does not mean that the Southern Pinwheel Galaxy has two black holes at its core, but that the single supermassive black hole in the galaxy may be ringed by a disc of stars that orbits around it, creating the appearance of a dual core at the galaxy’s centre. The galaxy’s visible nucleus is off centre, and astronomers have suggested that this may be the result of Messier 83 having absorbed a small satellite galaxy in the past. The nucleus may be what is left of the smaller galaxy’s core. It is offset from the true dynamical nucleus by approximately 200 light years. The best time of year to observe M83 is the spring. For observers in the northern hemisphere, the Southern Pinwheel Galaxy is not very easy to find and requires a 3-4-inch telescope and extremely dark skies for viewing. Those south of the equator can easily find the galaxy with small binoculars. 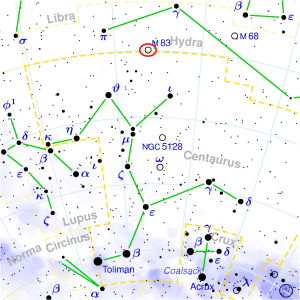 The galaxy can be found by first locating the stars Gamma or Pi Hydrae. 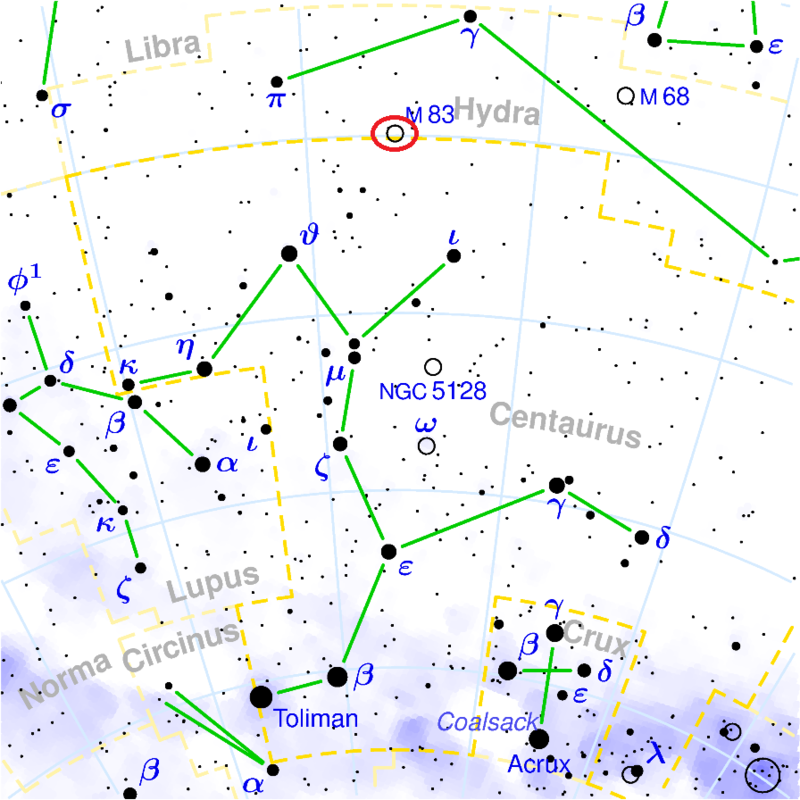 M83 lies to the northwest of Gamma Hydrae (6.5°N, 3°15’W), about a fistwidth away from the star. It is roughly at the same distance to the southwest of Pi Hydrae (3°15’S, 6°20’W). Observers in southern latitudes can locate the galaxy by first finding Iota and Theta Centauri, stars marking the head of Centaurus, and then hopping to stars i, h, k, and g Centauri. The stars g and i Centauri point in the direction of M83. Another way is to locate the bright stars Spica and Menkent. Spica, Alpha Virginis, is the brightest star in Virgo and Menkent, Theta Centauri, is an orange giant with a visual magnitude of 2.06. Messier 83 lies about three quarters of the way from Spica to Menkent. Spica can be found by following the arc of the Big Dipper. The two brightest stars along the imaginary extended line are Arcturus in Boötes constellation and then Spica. Charles Messier included the galaxy in his catalogue on February 17, 1781. The Southern Pinwheel Galaxy is the southernmost galaxy in Messier’s catalogue. 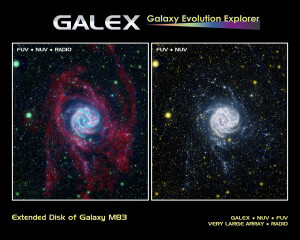 M83 was the first galaxy to be found beyond the Local Group. A double circumnuclear ring has been detected in the galaxy’s central region. Six supernovae have been observed in the Southern Pinwheel Galaxy in the past century: SN 1923A, SN 1945B, SN 1950B, SN 1957D, SN 1968L, and SN 1983N. Along with these, astronomers have found close to 300 supernova remnants in the galaxy, which help them learn more about the progenitor stars. The only two other galaxies with so many observed supernovae are Messier 61, also with six, and NGC 6946, which holds the record with nine supernovae. M61 is one of the galaxies in the Virgo Cluster, located in Virgo constellation, and NGC 6946, better known as the Fireworks Galaxy, lies in the direction of the constellation Cygnus. The supernova SN 1957D, a Type II supernova observed in M83 in 1957, is particularly notable. Astronomers discovered the supernova remnant in radio wavelengths in 1981, in visible light in 1987, and only recently in X-ray. The spectrum of X-rays indicates that there is a pulsar within the remnant. If true, this would be the youngest pulsar known. M83 contains around 3,000 star clusters. Some of them are less than 5 million years old. The brightest clusters are found along an arc near the galaxy’s centre. The Southern Pinwheel Galaxy is receding from us at approximately 513 kilometres per second. In June 2008, NASA’s Galaxy Evolution Explorer project announced the discovery of large numbers of newly formed stars in the galaxy’s outer regions. Astronomers had previously believed that these regions lacked the materials necessary for star formation to take place. Nicknamed the Southern Pinwheel, M83 is undergoing more rapid star formation than our own Milky Way galaxy, especially in its nucleus. The sharp “eye” of the Wide Field Camera 3 (WFC3) has captured hundreds of young star clusters, ancient swarms of globular star clusters, and hundreds of thousands of individual stars, mostly blue supergiants and red supergiants.